Firstly I must apologize for the photography the plants were too big and likely to cause way too much mess for my wife to let me indoors for this one. So they tend to get a bit lost in the background. 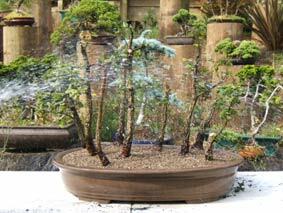 I went to a nursery that I use a lot intending to find some swamp cypress for this demo. I did find some nice trees, on the way out however I found these plants in the reject bin for $2 each and I could not pass them by. 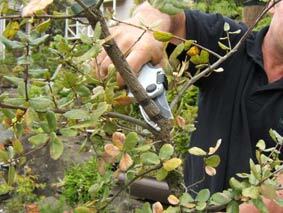 It is best to pick trees of a variety of ages with different sized trunks. A lot of group plantings I have seen have been made up with plants that came from the same source and are very similar in size and shape. No natural forest is like that and that’s the look we want so if you can pick plants of different size and age even if you have to go to several nurseries to get them. I have broken my own rule with these trees, but $2 each. The cork bark oak is a medium sized tree that develops thick corky bark hence the name. It is originally from the Lberian peninsula Dalmatia and nor-west Africa. The leaves are persistent, alternative and simple, with a pointed tip, dark green above and grey green below. The fruit is a nut (acorn) partially protected by a hemispherical cup. 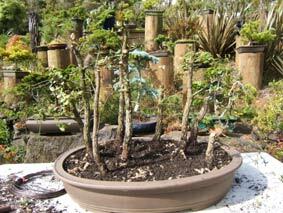 They are best repotted every two years in spring just as the buds open. 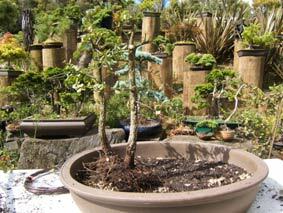 I have not seen this tree much in NZ and I think I will try some cuttings. 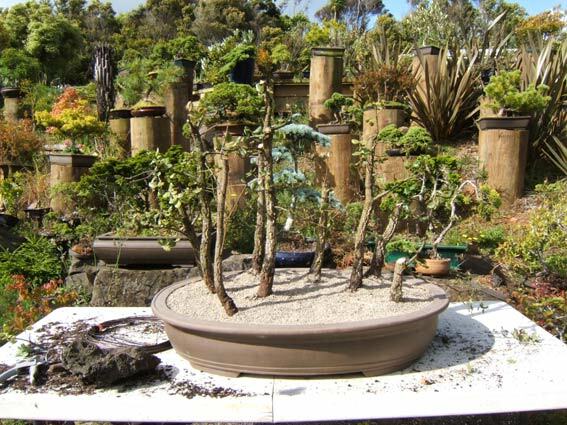 Ordinarily the number of trees planted in groups range from five to fifteen and for the sake of esthetic balance group bonsai are usually planted in odd numbers. Although the ideal is to create the impression of a large copse or forest with only a small number of trees, the most important consideration lies in the balance between the tray and the trees. 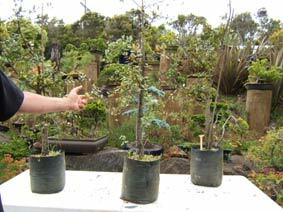 It is a good idea to prepare a larger number of varied trees, tall, short, thick and thin, large and small than is necessary, so that when you are ready to plant you will be able to select those best suited for the purpose. 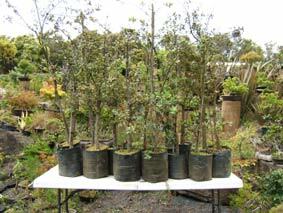 Back to our trees; I have picked 15 trees (all they had) but I intend to use only 9. Grade your trees according to size and shape, your first task is to find a primary tree. 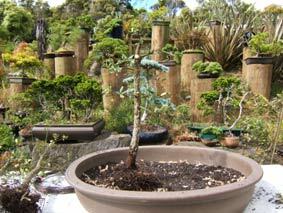 This tree is your focal point in the planting it is generally the largest and best shaped tree. I have picked this plant again I am sorry about the poor photography. 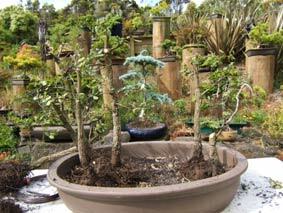 Loosen the roots as you would for any other bonsai. Try to leave some of the upper roots intact as you will be planting into a shallow tray some of the larger lower roots may need to be removed. 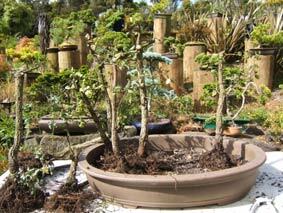 With corky bark oaks it is best to shorten the main root over a period of time (yet another rule broken). 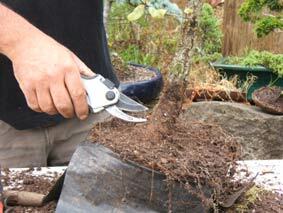 Quite a bit of root trimming may be necessary to fit all the trees into your tray. 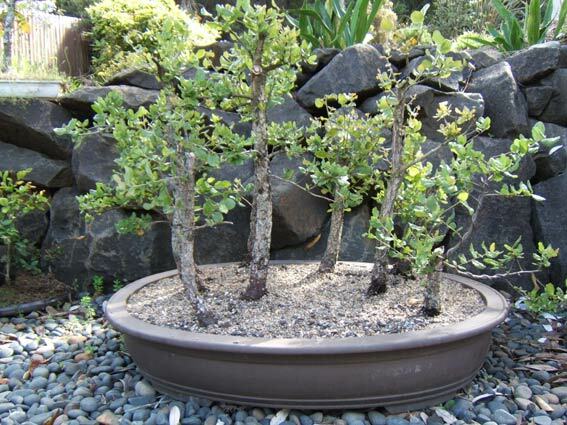 Trim off any short or weak branches this is necessary because the simplicity and straightness of the tree trunks is an important esthetic point in group bonsai. Our trees are going to need some major trimming. It is possible and probably preferable to carry out some styling and root reduction over previous years. 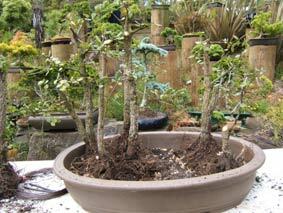 For this demonstration we will plant the trees and style them when they recover next year. Lets just say there are no hard and fast rules. This will be my primary tree. It has a good solid trunk and a pleasing shape. It looks kind of nice with the blue cedar foliage from behind. Hopefully it will develop some of its own once its roots hit some fresh soil. 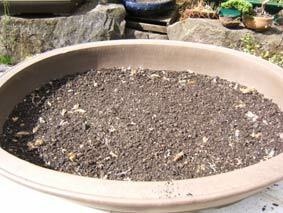 Prepare your tray with mesh over the holes and a thin layer of soil over the bottom of the tray. This tray is a bit deep for these trees but they have a lot of growing to do before they are anything like they need to be. This extra soil will give the plants a bit of root space and hopefully encourage some new growth before the end of summer. Position your primary tree, the largest best shaped tree about 1/3 the length of the pot from either the left or the right end. This is called the principal tree. Place a shorter tree to the left and in back of the principal tree. This is called an annex tree. Place another tree, smaller than the annex to one side of both the principal and annex. This is called a jumper tree and together with the principal and annex it constitutes the basic composition of group planting. We are now ready to place other trees around the principal being careful to position them at varying distances from one another so they will have a natural appearance. A small tree is placed to the left and behind the principal tree and another in front of the annex. A tree is placed to the right and behind the jumper. Another tree is placed to the right behind the principal. And a small tree to the back between the jumper and principal trees. 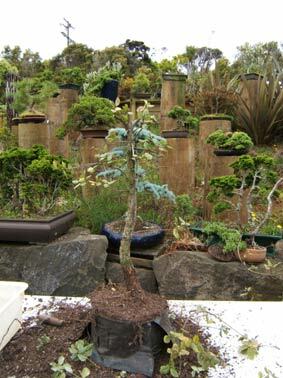 The last tree is placed to the back in the centre of the planting. 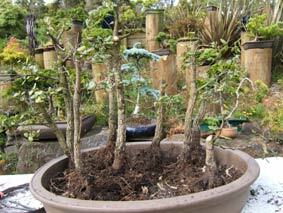 As I mentioned at the start the overall effect would be better with healthier trees with a greater variance in size. If you get the basic structure of principal annex and jumper tree right you can experiment for yourself with different placements of your remaining trees. Remember try to vary size, distance between trees and height for best effect. It is also best if when you look at the front of your planting no trees are in front of the ones behind. i.e. you should be able to see the trunks of all of your trees. Care should be taken not to bunch up the roots in the middle of the tray. 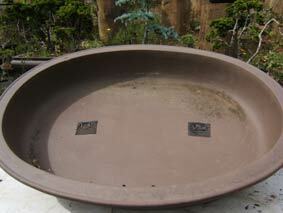 Try to lead the roots towards the centre and the edge of the tray and to the right and left of one another. Start filling the tray with soil and fix the position of the trees because so much root must be removed you may find it necessary to secure them temporarily with wire. Keep your new group partially shaded and out of the wind until roots firmly take hold between six and twelve months. 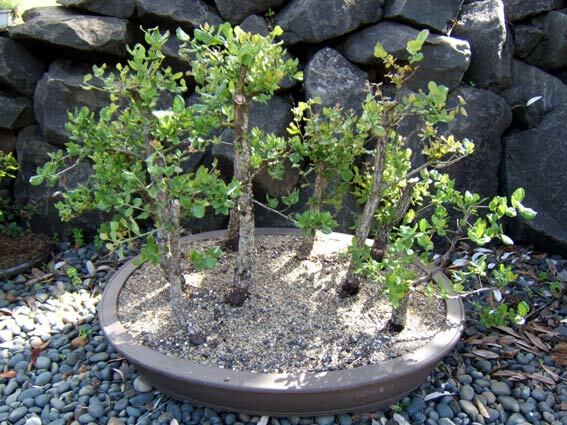 Training and trimming can begin in autumn if the group is planted in spring or as soon as the plants become firm in the pot. As you can see they love their new soil and have rewarded me with a lot of new growth. I will let them grow with just a bit of pinching until next spring. 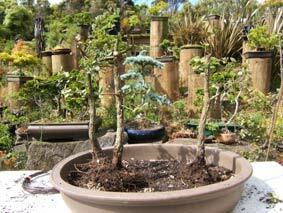 Then I should be able to pick out the branches that will be kept and maybe start on a bit of styling.